Silicone Heel Cup (pair) combines a pressure relieving heel spur cavity with a well designed heel cup, ideal for heel pain relief. Reusable Cold/Hot Gel Packs. Cold and warm therapy can help the healing process associated with soft tissue injuries. Microwavable, remains flexible when frozen. 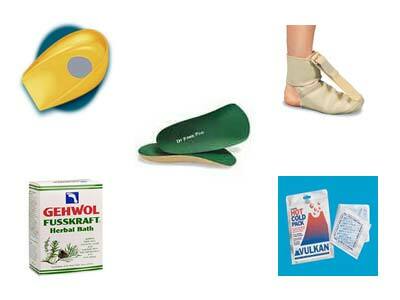 Apply cold therapy when the heel is acutely painful and heat therapy when the heel is in the healing phase. Dr Foot Pro Insoles. If you suffer from plantar fascitis or heel pain, you've found a friend in these ultra-supportive foot supports. The soft cover and the flexible EVA base material create an excellent arch support which immediately treats the cause of the heel pain. Gehwol Herbal Bath 400g folding bucket. A refreshing bath for tired and aching feet. Soak your feet in luke warm water and use gehwol herbal bath to relieve discomfort to your heel in a natural way. Planter Fx Night Splint. Speed up the heeling process of plantar fasciitis with this low profile, thermal lined bootie from Swede-O. The PF FXT allows you to sleep comfortably while gently stretching out the plantar fascia, the band of connective tissue that runs from the heel to the toe. Slip on the bootie and adjust the dorsal flexion (amount of tension) to pull back the toes towards the ankle. Not nearly as bulky as other night splints plus this item has a slip-resistant sole. Caution: Do not use on feet with open sores or ulcerations. Note: Intended for night-time use only. NOT FOR USE WHILE WALKING.